Quiet For The Street, Riot For The Strip!! Go from stealth quiet to wide open power and experience the gains even if you are already enjoying an aftermarket exhaust system. You control the volume, you control the power. Open your exhaust with the flip of a switch. Run it closed, run it all the way open or any position in between. Adjust your back pressure to save gas. 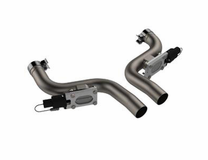 Does not matter whether you call it a electric exhaust cutout, exhaust dump or e-cutout you know your getting the ultimate exhaust upgrade for your car or truck. More Size Options than any other Cutout on the Market! Our kits are available for any application from old school muscle to high tech imports. Sizes range from 2.25", 2.5", 3", 3.5" and 4" our popular Low-Profile Oval Cutout kits and our Boss 302 kits. If your tight on space? No problem the Low Profile kits are totally customizable as they do not require the standard round Y-pipes. Instead we ship you our polished, connection tubes in the kit from there you cut the pipe to the length and angle that's just right for YOUR specific vehicle. Full Metal Jacket Protection QTP has taken our proven QTEC to the next level. After 2 years in R&D we are proud to offer on our electric exhaust cutouts with a new cast aluminum motor cover. Starting with CAD, we designed a cover for the electric motor. 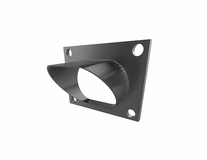 Cast with 360 grade aluminum, then CNC machined on the interior for a precision fit. We didn't stop there, we took it one step further using our powder coated finishing process to protect it and keep your electric cutouts looking better than ever! Whether your application is Street or Strip, Hot Rods to the Family SUV the Motor Cover provides your ride with Full Metal Jacket Protection. Another Industry First! Control your cutouts remotely with one of these Quick Time Performance wireless exhaust cutout controllers. They feature easy-to-use push button operation for partial or wide-open settings so you can retain control of the sound. The included transmitter is no larger than a standard business card, leaving you plenty of options for mounting, and has over a 100 ft. transmitter range. 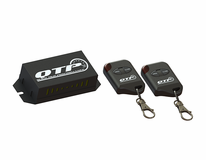 The Quick Time Performance wireless exhaust cutout controllers include two key fob remotes and are 100 percent compatible with Quick Time Performance electric cutout kits.